What a jewel of a poem--very nicely done. I appreciate poems with structure. I'm presupposing that English is not your first language (am I right? ), so that makes this achievement even better! Kelkhatan--does your name have special meaning? thank you, now the notifcation works well. I speak normally swiss-german but my heart beats for english especially in books and films. PPS. The name comes from my character in WoW (I gave up playing) and I though it would fit here. Hi Kelkhatan! I think you did a great job of coloring that in on the computer. I never would have known you did it that way. It's beautiful! And it did it very well, Kel . Thanks for sharing the poem. I'm looking forward to more - it's nice to see another poem on this thread! this results in a blurred picture of what could happen, and that procure the freedom of choice for us. I tried very hard to get away from film Frodo but he crept in without me even knowing it . Iolanthe, I do indeed like your Mirror. and I certainly don't think your representation of Frodo depicts from your painting at all. whilst our imaginations and Tolkien's descriptions develop images in our minds we are also influenced by PJ's films and perhaps not in a bad way either. Iolanthe that is so powerful - it stops you in your tracks! Thank you for sharing it. Glad you like it! I nearly destroyed it by knocking a bottle of white ink over part of it and having to do a rescue and camouflage job . I admit I was horrified when I saw a touch of Elijah there after trying so hard to ignore him. But my problem is that I have always seen Frodo as a rather older and more worn Elijah Wood . Iolanthe wrote: I admit I was horrified when I saw a touch of Elijah there after trying so hard to ignore him. But my problem is that I have always seen Frodo as a rather older and more worn Elijah Wood . I think you captured him as older and more worn very well! I love the painting and I think you did a great job of repairing the ink damage. I can't even tell where it was! This is getting to be an impressive series, Iolanthe! The 'stained glass' look really suits this one especially well. I like the circles. 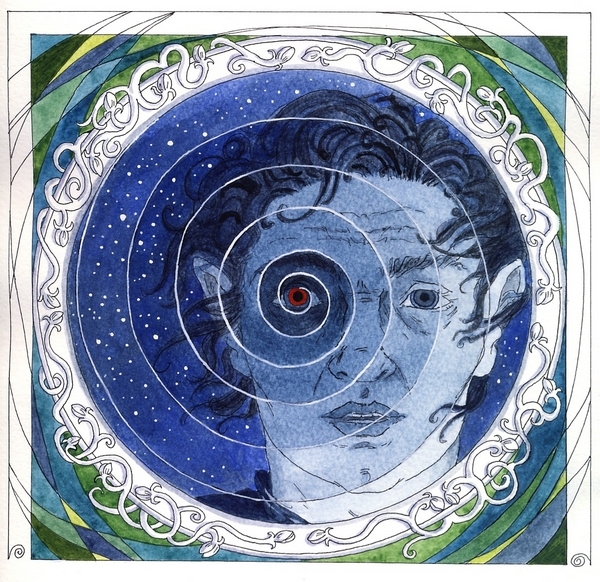 Talking about series.....any more poems in the offing, Merry, perhaps inspired by the elves . Oh, my, the last one nearly did me in! But I'll try to tune into a Muse to see if anything comes to be. 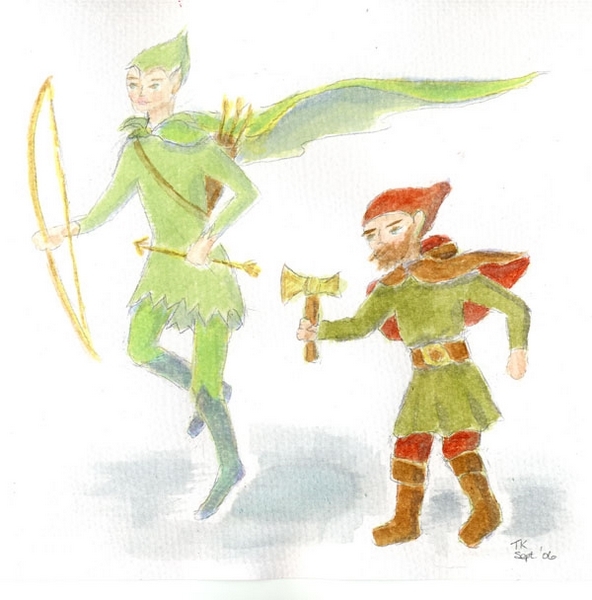 Here's my contribution - a watercolour showing how I first imagined Legolas and Gimli. Inspired by the conversation elsewhere on these forums about the colour of Legolas's hair. I realised I never imagined him with hair! Then I remembered that I never separated Legolas and Gimli, so of course Gimli had to be included in the picture too . . . Legolas is a sort of cross between Robin Hood and the Flower Fairies, while Gimli owes a lot to Disney, I feel. Well, I did first read LOTR back in the Seventies!!! Last edited by marbretherese on Wed Apr 11, 2007 8:11 am, edited 2 times in total.